After a long series of experiments, researchers at the Pacific Medical Center in San Francisco recently showed that the constituents of our food alter our moods and thoughts by changing the chemistry of the brain. Their statement: "The food that we eat has intimate effects on the brain, on our appetite, our mood, curability to sleep and to think." A practical proof of this is that the students at schools in Fulton County, Georgia, where junk foods have been banned in favor of natural and nutritious meals, are reportedly learning quicker, staying healthier, and even behaving better. Devotees of Lord Krishna eat only prasadam (vegetarian food that's been offered to Krishna). What effect does prasadam have on the brain? Besides doing all the good things that any well-balanced vegetarian diet does, prasadam also gives us the ability to think clearly about the nature of matter, spirit, and God. How? Not because it contains certain vitamins and minerals, or complementary proteins, or just the right amount of the right kinds of carbohydrates. Prasadam has all these things, but that's not why it's spiritually potent. Since prasadam isn't material, we can't analyze its spiritual potency in material terms. Only by appreciating the value of offering our food to Krishna can we understand how prasadam can make us spiritually intelligent--so intelligent, in fact, that we feel inclined to chant the holy names of God and dance in ecstasy. Naturally, the average person will pooh-pooh this effect of prasadam, considering it the result of religious fanaticism, brainwashing, or mere sentimentality. 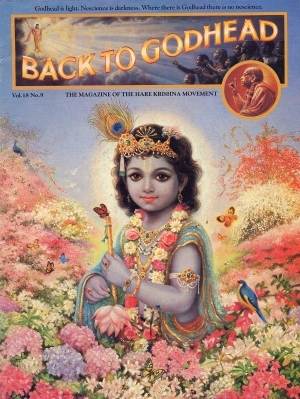 But those with a little faith--the above-average--can take note of this statement from the foremost of all Vedic scriptures, the five-thousand-year-old Srimad-Bhagavatam: "In the present Age of Quarrel and Hypocrisy, those who are intelligent will worship God by performing congregational chanting of His holy names." Of course, one thing about prasadam that none of us needs any scriptural proof for is that it tastes great. And that's part of the meaning of prasadam--"the mercy of the Lord." Out of His mercy, Krishna makes Himself available to us in the form of delicious spiritual food. We can all enjoy prasadam to our hearts' content, whether we know its spiritual potency or not. And even if we're unaware of its spiritual potency, prasadam makes us spiritually intelligent, just as nutritious food makes us healthy even if we don't know it's nutritious. 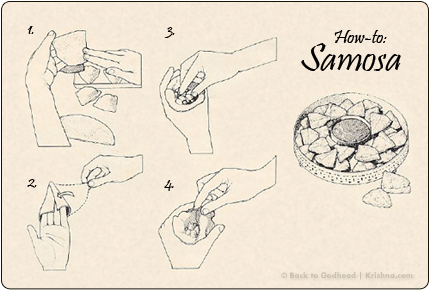 This month we're featuring one of the most popular of all prasadam preparations: the deep-fried, stuffed savory pastry called samosa.